Sally Matthews, soprano; Lawrence Brownlee, tenor; Christian Gerhaher, baritone; Simon Rattle, Berlin Philharmonic Orchestra and Berlin Radio Chorus. EMI 7243-5-57888-2. 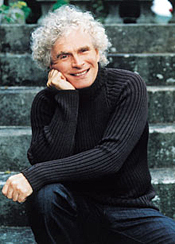 Since moving to the conductorship of the Berlin Philharmonic some years ago, Sir Simon Rattle has been advocating live recording with a vengeance. I admit this often produces more lively and spontaneous results, having a real audience during the performance, but it doesn’t always do a lot for a recording’s sonics. 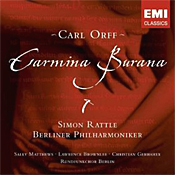 Such is the case with Rattle’s release of Carl Orff’s Carmina Burana, that perennial favorite of music lovers the world over, as well as movie directors and television producers. First, the performance. The soloists, chorus, and orchestra seem at first glance letter perfect, as we might expect from these people, and Rattle’s interpretation is vigorous, to say the least. The reading is, however, perhaps a touch too slick for its own good, lacking some of the earthiness the work might have found by its being slowed down a tad rather than taken at such extreme tempo changes. Rattle’s slowly and softly articulating one section of the music and then blasting it out fast and loud in the next can be exhilarating for a while but ultimately taxing on the mind and the ears. Nor do his singers always provide him the best support. Created in 1937 and based on thirteenth-century manuscripts in Latin, French, and German, the Carmina Burana songs divide into three parts covering the pleasures of springtime, drinking, and love, all within the framework of “Fortuna,” luck or fate. Under Rattle, everything seems quite energetically pursued, but, as I say, those drastic changes of pace tend to undermine the whole enterprise. The live sound, made in the Philharmonie, Berlin, in 2004 does not appear to me as convincing as most studio recordings, the way it’s miked making some instruments fade into the background or suddenly jump to the forefront. The solo voices come off best, very clear and natural in their presentation, but the orchestra fares more poorly. The sound, quite dynamic, is rather bright in the climaxes and fortissimos, somewhat muted at other times, and slightly thin overall. Frankly, despite the newer digital origins of the Rattle disc, I found it inferior to the older, analogue recordings of Andre Previn (EMI) and Eugen Jochum (DG), whose interpretations seem to me more refined, more robust, more consistent, and, yes, better recorded. 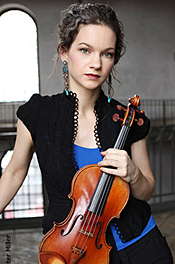 Hilary Hahn, violin; Volker Bertelmann (Hauschka), prepared piano. DG B0016798-02. 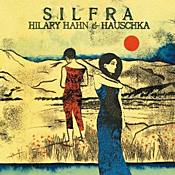 Violinist Hilary Hahn and pianist/composer Volker Bertelmann (who sometimes goes by the alias Hauschka when performing on the prepared piano) took their inspiration from the “otherworldliness” of the Silfra region to compose and improvise the twelve selections on the disc. So, what we’ve got here is an experimental album of music recorded the first time the performers played it. The participants tell us “there were no retakes. These are the moments that brought these ideas to life.” While it may not be high art, it is mostly appealing. Oh, and what is a prepared piano? According to my Random House Unabridged Dictionary, it’s “a grand piano that has been altered for some modern compositions by having various objects attached to its strings to change the sound and pitch, and performance on which typically involves playing the keys, plucking the strings, slapping the body of the instrument, and slamming the keyboard lid.” Sounds kind of wild, no? In this case, not quite. The twelve pieces of music Ms. Hahn and Mr. Bertelmann perform sound sometimes hauntingly beautiful, sometimes frustratingly common, yet continuously fascinating. The first piece on the program they call “Stillness.” One can understand why. It feels as though it’s simply floating out there in the aether. Unfortunately, it’s very brief, under two minutes, and could have gone on longer. The second piece is just the opposite of the first. “Bounce Bounce” sounds like an Ozark bluegrass hoedown. The artists tell us they intended the music to represent unrest, a rubber ball bouncing back and forth. I found it rather noisy. “Clock Winder” was by far more to my taste, a series of sounds like the innards of a clock in motion. It has a strangely disquieting yet vibrantly humorous quality that is quite fetching. And so it goes. Other tracks include “Adash,” with its weird, occasionally eerie stretches of rhythms and vibrations. “Godot” is, as the name implies, all about waiting, with Bertelmann’s prepared piano playing any number of parts in a quiet conversation with Ms. Hahn’s violin. At a little over twelve minutes, it’s the longest work on the disc. “Krakow” is the most conventional piece on the program, a lovely melody the performers made in advance of the other music. It is the least gimmicky and sweetest music of the bunch in its lightly melancholy way. I think you get the idea. Most of the music is serenely forgettable, to be sure, yet its misty, atmospheric, impressionistic visions and its varying harmonies and sensations beg one to listen again. Despite its not being great, classic, or enduring music, it might just be something you find yourself returning to a few times more than you initially anticipated. Of course, it helps to have two world-class artists to bring it all off. Otherwise, it would merely be a couple of people appearing to make it up as they go along. Recorded and mixed at Greenhouse Studio, Iceland, in 2011, the sound is fine for what it is, with Bertelmann’s piano contraption spread widely across the soundstage and Ms. Hahn’s violin a bit more precisely located. Depending on the tune, the sounds of the instruments can be slightly vague or almost startlingly lifelike. But I don’t suppose the performers intended any of their music to be particularly realistic in any traditional sense, so the oddity of the sonics probably contributes to its overall eccentric, experimental feel. First-generation stereophonic copy of the original stereophonic master. HDTT KLIPSCH-1. What HDTT have done is take selections from three of Klipsch’s tapes and transfer them to CD. The disc contains twelve musical tracks and ends with an interview with Klipsch. The music comprises small jazz ensemble pieces and large organ works, so the results show off most aspects of a speaker’s range and power. Whether you actually enjoy the music is probably secondary to the recording quality involved, but in any case it is fairly well performed and fun overall. Now, here’s the thing: Most people today are unaware that the state of stereo recordings hasn't really improved much (or at all) since the early Fifties. 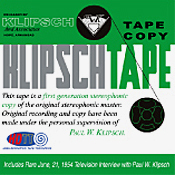 I listen daily to brand-new recordings that haven't nearly the depth, breadth, range, or fidelity of the Klipsch tapes, which were among the first of their kind. Strange world. Next is an impressive organ recital by John Eargle that includes Bach’s Toccata in D minor, Langlais’s Arabesque for the Flute, Gigue, Liszt’s Harmonies du Soir, and Alain’s Litanies. From the final demonstration tape, we get three numbers by Flem Ferguson and his Dixieland Jazz Band: “Lady Be Good,” “Way Down Yonder in New Orleans,” and, the best of the lot, “Muskrat Ramble.” If you can’t find any demo material in here, you just are trying. The tapes carry with them a few background noises associated with live, unedited performance. You live with it. 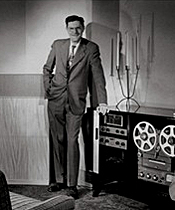 The disc concludes with a June, 1954, television interview with Paul Klipsch, about ten minutes of audio. He’s an amusing gentleman, and the information he provides, while rather elemental, is nevertheless captivating. To be sure, the sound of the HDTT disc is quite good, if not quite in the absolute audiophile category we know today. However, to be fair, there are only a handful of topflight audiophile discs in that category, so maybe the point is moot. This HDTT disc displays an excellent separation of instruments in the jazz pieces, with the kind of wide left-to-right stereo spread we would expect from early loudspeaker demonstration tapes. Transient response is relatively quick; the dynamic range is reasonably expansive; impact is strong; lows are taut; and midrange definition is fine, if to my ears a trifle soft. Most important, I found no noticeable distortion even at very high playback levels. Maybe in some of the jazz numbers there could have been a tad more air to the acoustic (they’re a trifle close and dry), yet in the organ pieces one hears a good sense of ambience and occasion, with lifelike hall resonances. In all, the disc provides not only splendid sound and rewarding musical experiences but a valuable historical document that should interest most hi-fi fans. Although there is not a lot of content involved (about forty-four minutes of music, plus an additional ten minutes of interview), it’s a matter of quality over quantity. As always, the folks at HDTT make the music available in a variety of formats for a variety of pocketbooks, from Redbook CD’s, 24/96 DVD’s, and HQCD’s to 24/96, 24/192, and 16/44 Flac downloads for playback on high-end computer audio systems. For details, visit http://www.highdeftapetransfers.com/storefront.php. Season includes Lera Auerbach as featured composer, eight-state national tour, tour tour kick-off concerts, Benjamin Britten Centennial concerts, and return appearances by soprano Melody Moor and pianist Anne-Marie McDermott. Music Director Nadja Salerno-Sonnenberg and the New Century Chamber Orchestra announce the 2012-2013 Season including four subscription weeks and two special tour kick-off concerts. The ensemble’s 21st Season, Nadja’s fifth as music director, includes composer and pianist Lera Auerbach as Featured Composer, New Century’s most extensive national tour to-date, a concert series celebrating the centennial of composer Benjamin Britten, Vivaldi’s beloved work The Four Seasons, and the return of New Century favorites Anne-Marie McDermott and Melody Moore. The 2012-13 Season will also include an Open Rehearsal Series, featuring five Rehearsals in San Francisco, which will allow audiences to experience the Orchestra’s dynamic and collaborative rehearsal style. On May 8, in conjunction with the announcement of the 2012-13 Season and in celebration of the exciting artistic partnership established between Nadja Salerno-Sonnenberg and the ensemble, NSS Music releases On Our Way: The Journey of Nadja Salerno-Sonnenberg and the New Century Chamber Orchestra. The DVD candidly reveals how one of the most electrifying soloists and daring recording artists in the classical music world came to partner with New Century Chamber Orchestra and includes a live tour concert and behind-the-scenes footage of rehearsals and candid comments from orchestra members revealing their personal journey with music. The 2012-13 Season opens with a celebration of Britten’s centennial featuring the composer’s Simple Symphony and Les Illuminations, performed by soprano Melody Moore. Writing of the 2007 performances in San Francisco Classical Voice, which also featured Ms. Moore, Lisa Hirsch said… “Les Illuminations is most commonly performed with a full-size string orchestra….NCCO's nineteen players might as well have been fifty, so overwhelming was the performance. The piece soars, glitters, buzzes, thrums like a guitar, and over it all, the soloist must also soar. She (Moore) matched Britten and NCCO's wizardry note for note, phrase for phrase, executing every detail in the score with complete command and captivating the audience in the process.” Bartok’s Divertimento is also featured in the program. Pianist-composer Lera Auerbach joins New Century for the 2012-13 Season as Featured Composer, a program begun by Salerno-Sonnenberg in her first season as music director. The composer’s Sogno di Stabat Mater for Solo Violin, Viola, Vibraphone and String Orchestra,a reworking of the 18th-century Italian sacred work by Giovanni Pergolesi’s famous Stabat Mater in which Auerbach filters the old baroque style through a contemporary lens, will be featured on concerts in December. To showcase the ensemble’s virtuosic musicians as soloists, the December concerts also feature Vivaldi’s beloved The Four Seasons, Handel’s Solomon, Entrance of the Queen Sheba and Clarice Assad’s Suite for Lower Strings, based on themes of Bach. A world premiere from Lera Auerbach will close the season in May. Written expressly for New Century, the work is entitled Sinfonia for Strings (Primera Luz). Joseph Haydn’s Symphony No. 45: “Farewell” and Richard Wagner’s Siegfried Idyll, commemorating the bicentennial of Wagner’s birth, complete the final subscription concert program. Subscriptions to the New Century Chamber Orchestra are on sale now. Regular Subscription packages range from $104 to $224; subscription packages including a Tour Kick-Off concert range from $130 to $280. Create-Your-Own Subscriptions are also available. Call (415) 357-1111 ext. 4 or email info@ncco.org to request a season brochure. Single tickets range in price from $29 to $59 and go on sale August 1 through City Box Office: www.cityboxoffice.com or at (415) 392-4400. Discounted $15 single tickets are available for patrons under 35. The National Philharmonic has been selected by the Maryland Classic Youth Orchestra Board of Directors to receive the 2012 MCYO Chester J. Petranek Community Award for outstanding community service in enriching the musical life of the Washington Metropolitan Area. This award was established in 1986 as a tribute to Chester J. Petranek, the distinguished educator and conductor who founded MCYO, now a top youth orchestra program, in 1946. The award is presented each year to an individual or group for “outstanding community service in enriching the musical life of the Washington Metropolitan Area.” Past winners have included the Baltimore Symphony Orchestra, David Lashof of Lashof Violins, Dale Music Company, the Friday Morning Music Club and Chuck Levin of Chuck Levin’s Washington Music Center. With this award, the MCYO is expressing its appreciation and gratitude for the many exemplary contributions the National Philharmonic makes in support of young musicians. The award will be presented at the forthcoming MCYO concert on May 20th at 3 p.m. in the Music Center at Strathmore concert hall. For tickets, please visit www.strathmore.org. The Music Institute of Chicago confirmed its status as one of the best schools in the nation for chamber music study with students from its prestigious Academy for gifted pre-college musicians earning first and third place wins in the Junior Division of the 2012 Fischoff National Chamber Music Competition. The Music Institute offers one of the largest and most accomplished chamber music programs in the U.S. and presents some of the finest chamber music ensembles at Nichols Concert Hall. Founded in 1973 in South Bend, Indiana, the Fischoff National Chamber Music Competition, presented by the Fischoff National Chamber Music Association, has become the largest chamber music competition in the world and one of the most illustrious classical music prizes attainable today. Since its founding, more than 5,000 musicians have participated, many of whom have gone on to distinguished careers in music performance and education. Quartet Stracciatella, coached by Academy faculty member Marko Dreher and featuring Erika Gray, violin (16, Wilmette); Hyun Jae Lim, violin (14, Wilmette); Stephanie Block, viola (17, Barrington); and Johannes Gray, cello (15, Wilmette), earned the First Place Medal and Scholarship of $2,000. The Third Place Medal and Scholarship ($1,000) went to the Quartet Ardella, coached by Academy faculty members Hans Jorgen Jensen and Desiree Ruhstrat and featuring Laura Park, violin (18, Des Plaines); Jennifer Cha, violin (16, Naperville); Devon Naftzger, viola (18, Lincolnshire); and Ben Solomonow, cello (16, Evanston). In addition, the judges made an unprecedented move to award two honorable mention designations, one of which went to the Academy’s Pallas Trio featuring Kelly Talim, violin (16, Buffalo Grove); Mariel Werner, cello (20, Belgrade, Montana); and Kate Liu, piano (17, Winnetka). In addition to wins at Fischoff, two Academy chamber groups made it to the final round in this year’s St. Paul String Quartet Competition, showcasing the nation’s finest pre-college string players. Academy groups took first and second place in both 2009 and 2010. This year, Quartet Ventoso, coached by Academy faculty member Desiree Ruhstrat and featuring Jennifer Cha and Erika Gray, violins; Caitlin Adamson, viola (17, Evanston); and Johannes Gray, cello, received the Haydn Prize for best interpretation of the master’s work and Audience Prize. Another competition in which the Academy has dominated is the Jules M. Laser Chamber Music Competition, which offers chamber ensembles with members ages 10–18 the chance to win a $1,200 award, live broadcast on WFMT 98.7 and performance opportunities at the Music in the Loft and 2012 Society of American Musicians’ Winner's Concert. This year, Quartet Ventoso took first place, the fourth consecutive year of first place wins for Music Institute ensembles. Broadcast on more than 200 stations nationwide to an audience of more than 700,000 listeners each week, From the Top is one of the most popular classical music programs on radio. Many Music Institute students and alumni have performed on the program, most recently the Academy’s Al Dente String Quartet featuring Ade Williams, violin (14, Chicago); Claire Bourg, violin (17, Aurora); Caitlin Adamson, viola (17, Evanston); and Tara Safavi, cello (16, Naperville). The Music Institute of Chicago offers one of the largest chamber music programs in the U.S. with nearly 200 Community Music School chamber music participants each year and more than 30 dedicated coaches. Ensembles in residence—Lincoln Trio, WarnerNuvoza, Quintet Attacca (2002 Fischoff Grand Prize Winner) and Axiom Brass (2010 Fischoff winner and 2011 Fischoff Educator Award)—enhance faculty instruction as well as expose Chicago-area students to chamber music through the Music Institute’s ArtsLink outreach program. The fall application deadline is July 15; late deadline is September 1. For more information visit musicinst.org/chamber-music. In addition to its robust program of chamber music instruction, the Music Institute of Chicago presents some of the best professional chamber groups working today in the historic Nichols Concert Hall. Celebrating its 10th anniversary during the 2012–13 season, Nichols will host the Lincoln Trio (September 23), winners from the 2012 Fischoff Competition (October 21), WarnerNuzova (November 17), Pacifica Quartet (February 16), the Lincoln String Quartet, and more. For more information visit musicinst.org/nichols-concert-hall. 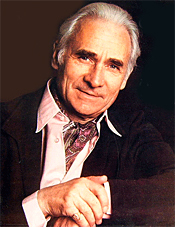 Jean Martinon, Orchestre National de l’ORTF. Brilliant Classics 94360 (2-disc set). Do I see a trend here? Well, it’s a trend that’s been developing for the past decade or more: Smaller record companies are licensing older recorded material from bigger companies and re-releasing them. Think of PentaTone, Newton Classics, FIM, HDTT, and now Brilliant Classics. 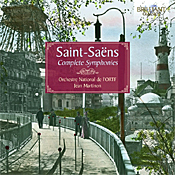 The case in question here is Jean Martinon’s recordings of the complete Saint-Saens symphonies, which Martinon recorded for EMI in the early-to-mid Seventies. The thing is, it’s not as though the EMI editions are hard to find. A quick glance at Amazon shows there are actually four different EMI editions available new, two from the parent company, one from EMI France, and one from EMI Japan. Yet in 2012, EMI apparently licensed the recordings to Brilliant Classics, and they all sound pretty much the same. Whatever, you can never have enough editions of these fine Martinon performances, so the more, the merrier. French composer and pianist Camille Saint-Saens (1835-1921) wrote five symphonies; however, only one of them, the Third “Organ” Symphony, became at all popular. Even so, its popularity is so immense, it doesn’t matter that the others have found relatively little favor. They’re still interesting, but quite overshadowed by their big brother. It’s good to have them all together in one package if for no other reason than curiosity’s sake. Who knows; a person familiar only with the Third might soon find a new favorite among the others. Anyway, Saint-Saens wrote his first two symphonies, the Symphony in A major (c. 1850) and the Symphony No. 1 in E flat (1853), while he was still in his teens. Then, he wrote the Symphony in F “Urbs Roma” in 1856 for a writing competition, which may explain why they aren’t quite as mature and well developed as the later works. Even the Symphony No. 2 in A minor (1859) is a relatively early, youthful piece, especially when you consider that the composer didn’t write his monumental Third Symphony until 1886. Thus, what we have are four symphonies written when Saint-Saens was in his teens and twenties, and the final one over a quarter of a century later when he was in his early fifties. Disc one of this two-disc set begins with the little Symphony in A, unpublished in the composer’s lifetime and seldom recorded. That’s OK; I doubt that anyone could do it more justice than Martinon. There’s plenty of youthful vitality in the work, and Martinon seems to delight unapologetically in it. There’s a lot of Mozart and Mendelssohn in the music, too, which Martinon enjoys as well. Next come the first two numbered symphonies that Saint-Saens published. Symphony No. 1 begins with a delightfully lilting Adagio that shows the influence of Schumann. The second movement is reminiscent of Bizet; the slow movement of Berlioz; and the finale typical of much French ceremonial music. Martinon pulls all of it off with finesse, making it appear more original and substantial than it probably really is. Then, disc one concludes with the Symphony No. 2, the best of which comes early, in the first-movement Allegro. It displays a lively seriousness not found in Saint-Saens’s early works. The symphony soon transitions into a more-temperate and completely charming Adagio. The Scherzo and finale return to the energy of the first movement, where Martinon maintains the music’s Mendelssohnian mood and style. Disc two opens with the unpublished Symphony in F, subtitled “Urbs Roma” (Rome city or city of Rome). Martinon manages to infuse it with a grand sweep that is really quite engaging, especially in the vibrant if slightly dark Scherzo. Still, the work is really just a prelude to the composer’s monumental “Organ” Symphony that follows. With Martinon’s handling of the Symphony No. 3 in C minor, we get an elegant, graceful, refined reading. Not that it doesn’t catch fire, but if you want something more dashing and exciting, I recommend Charles Munch and the Boston Symphony Orchestra (RCA or JVC) or Louis Fremaux and the City of Birmingham Symphony Orchestra (EMI), who are more explosive in the work. Nevertheless, Martinon pumps up the adrenaline levels, too, while providing a relaxed, expansive, wholly sympathetic interpretation. The recordings, which EMI made in 1972 and 1974 for the four early symphonies at the Salle Wagram, Paris, and in 1975 for the Third Symphony at the Eglise Saint-Louis de Invalides, Paris, sound uniformly good, if a tad on the warm, soft side. The stereo spread is wide, although the stage depth seems somewhat limited, except in the Third, where it opens up a little more. While the bass could be deeper for the organ, it’s a minor concern. Dynamics also seem a bit restricted; again, not to worry. Overall, this is an extraordinarily smooth, accommodating sound. Harold Farberman, Colorado String Quartet; Ethos Percussion Group. FIM XR24 044. This is an odd but fascinating one. Sonically, the disc sounds better than almost anything you’ll find on CD, no surprise considering it is a fairly recent XRCD24 recording from First Impression Music, FIM, whose audiophile work has been consistently good. Yet musically, you may have to get adjusted to some of the arrangements and interpretations. 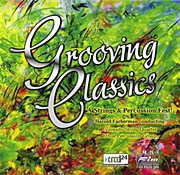 Except for the unfortunate title, Grooving Classics, which conjures up in my mind visions of John Travolta and bell-bottom trousers, we have conductor Harold Farberman’s sometimes scintillating, sometimes eccentric reworkings of famous classical music for string quartet and four-person percussion ensemble. Some of it works; some of it, well, not so much. Call it an adventure. Things get off to a good start with the second movement Andante from Haydn’s “Surprise” Symphony. The “twinkle, twinkle little star” variation works well with a toy piano and various light percussion, joined in the “surprise” by the strings and a big timpani drum. But that’s followed by Farberman’s curious reworking of Mozart’s Eine Kleine Nachtmusik, which he so distorts as to be almost unlistenable. To each his own, I suppose. The “Can Can” from Offenbach’s Le Contes d’Hoffmann comes off well, probably because it’s rather raucous music to begin with; the popping of champagne corks (balloons, actually) adds to the fun. Then, the Adagio from Dvorak’s “New World” Symphony suffers from a peculiar combination of instruments, as do some of Tchaikovsky’s dances from the Nutcracker. However, there are also some outstanding items on the album, among my three favorites being Strauss’s Fledermaus overture; the traditional “Red River Valley”; and with the Northwest Sinfonietta a special track of Faberman/Bizet’s “Habenera Fantasia” from Carmen. You can also find the latter two pieces on FIM Super Sounds! (XR24 066) and FIM Super Sounds! III (XR24 073). Anyway, as I say, it’s hit and miss. Beyond questions of musical taste, however, there is nothing amiss with the sound. The production team can’t be beat: Producer Winston Ma, recording engineer Keith Johnson, and editing engineers Tam Henderson and Paul Stubblebine. Keith and Tam you may recognize as the guiding forces behind Reference Recordings. Recorded at the Richard B. Fisher Center for the Performing Arts at Bard College, New York, in 2005 and using 1/2” analog tape at 15 ips, their work results in a startlingly real sonic picture, with as extended highs and as well-controlled lows as you’ll hear anywhere. The stage dimensions are wide, the dynamics are strong, the ambient bloom is warm and natural, and the overall effect is as clean as it gets. Pick the few pieces you like best, and you have a first-rate, modern (albeit expensive) XRCD demo disc. Also, Prelude a l’apres-midi d’un faune; Images. 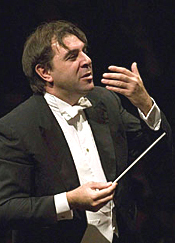 Daniele Gatti, Orchestre National de France. Sony Classical 88697974002. 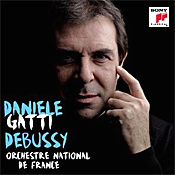 I have never been as big a fan of Italian conductor Daniele Gatti as most of the world, but I have to admit there is a lot to like in his new recording of Debussy orchestral works. Where his sometimes flamboyant style can be annoying to me on occasion, he pretty much lights up the Debussy music, especially La Mer and Images, which sound effervescent and imaginative and, well, new again. The program begins with La Mer, which French composer Claude Debussy (1962-1918) wrote in 1905 as a symbolic representation of the sea. The composer purposely meant for the first movement, “From dawn to noon on the sea,” to be less colorful and scintillating than the other movements, yet Gatti infuses it with a lovely life of its own. After a warmly atmospheric introduction, it opens up beautifully about halfway through to a rapturous melody. In the second movement, “Play of the waves,” Gatti is appropriately playful and light, the dancing waters luminescent, sparkling, and magical. Then comes that well-known third-movement finale, “Dialogue between wind and waves,” which Gatti pulls off in splendid fashion. It’s such familiar music, it’s hard to believe anyone could do anything particularly innovative with it without upsetting Debussy’s perfectly tuned impressions. Nevertheless, Gatti does just that, managing to conjure up a sweetly rugged vision of the sea that maybe even the composer didn’t imagine. In the end, Gatti’s enthusiasm enriches the experience, making his performance of La Mer one of the more powerful and creative you’ll find. The interpretation bears comparison to those of Martinon, Karajan, Previn, and Stokowski, and that’s compliment, indeed. Accompanying La Mer, we find a rendering of Prelude a l’apres-midi d’un faune that isn’t quite as ethereal, dreamlike, or sensuous as those of Karajan or Martinon, but it is a solidly vivid characterization and should not disappoint Debussy fans. After that, we get the Images for Orchestra, based on work Debussy wrote for piano. The composer intended the Images to be less impressionistic than La Mer, more precise in style and meaning, which Gatti understands. He fills his performance with energy, to be sure, yet it is well-directed energy without an ounce of flab to the reading. There is no romanticizing here, nothing soft or vague. Whether it fully captures the Spanish idiom it reflects is a matter of taste, I suppose, but I found it full of flavor, if in its structured, glowingly ardent presentation. The sound, recorded in the Salle Lieberman, Opera Bastille, Paris, and Alfortville, France, in 2011, is almost ideal for these works. In the La Mer and Preludes it’s delicate and open, with a wide, deep stereo separation; good tonal balance; a clean, natural lower midrange; and a moderately resonant acoustic. There is a slight forwardness to the upper mids, but it’s mild. While bass could be a bit stronger, dynamics are fine. The Images benefit from even greater impact and more sharply focused definition than La Mer, which is as it should be. Both venues suit the varying temperaments of the music. 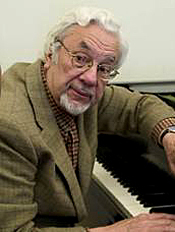 Byron Janis, piano. EMI Classics 50999 6 02898 2 7. 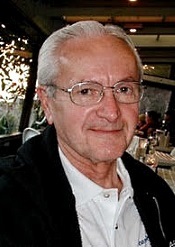 Although American pianist Byron Janis has recorded for several companies--including RCA, Mercury, and EMI--it is for his work with Mercury in the Fifties and Sixties that I personally know of his work. I have long been a fan of his Rachmaninov, Prokofiev, and Schumann recordings, but I seem to have lost track of him after his lifelong bout with arthritis flared up in the Seventies and he went into semiretirement. But in the mid Nineties he recorded these Chopin pieces for EMI, and he apparently has been working continuously ever since. This is all the remarkable considering that he celebrated his eighty-fifth birthday the year of this writing. Anyway, what we have here is a collection of Chopin mazurkas, nocturnes, waltzes, and impromptus that Janis recorded in 1996 and 1999. 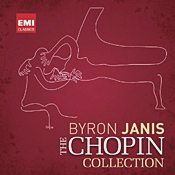 EMI released most of them in the 1996 album Byron Janis Plays Chopin, now out of print; and in this 2012 rerelease the company adds several more pieces that Janis recorded a few years later after the pianist accidentally discovered two unknown versions of Chopin waltzes. Altogether, the eighteen selections on the disc provide a superb representation both of Chopin’s brilliance and Janis’s artistry. My own favorite pianists in Chopin have long been Maurizio Pollini and Arthur Rubinstein, but after hearing Mr. Janis, a pupil of Vladimir Horowitz, I can easily see how one might change one’s allegiance. Janis’s smooth, easy, gentle, flowing style here belies his reputation for fierce drive and nervous tension. In Chopin, at least, the man remains relaxed yet completely in control. The program opens with the Mazurka No. 1 in G minor, Op. 24, which Janis plays at a moderate pace; no helter-skelter showmanship for its own sake here. He follows it with the Nocturne in E flat major No. 2, Op. 55, maintaining the same low-key manner as in the mazurka, allowing the music to float softly to our ears. “Above all,” says Janis in a booklet note, “the essence of Chopin’s music was zal, the Polish word for ‘bittersweet.’ It expresses all of the tenderness and humility of regret borne with resignation. ... It was his way of depicting the tormented history of his beloved Poland.” And so it goes, on through the rest of the selections, each a delicately polished gem. My own favorite tracks, for what it’s worth? The Nocturne in B major No. 2, Op. 32; the Waltz in A minor No. 2, Op. 34; the Mazurka in B flat minor No. 4, Op. 24; the Nocturne in F sharp No. 2, Op. 15; the Nocturne in D flat major No. 2, Op. 27; and the two concluding Waltzes--G flat major No. 1, Op. 70, and E flat major, Op. 18 “Grande valse brilliante.” Lovers of Chopin’s music can hardly find better. The piano sound is full and rich, the EMI engineers having well captured the instrument’s mellow, resonant tone. It’s not too close, either, and doesn’t stretch clear across the room as some piano recordings are wont to do. Instead, the instrument sits comfortably before us as a real piano might, producing warm, calming music. LVMH Moët Hennessy Louis Vuitton, the world’s leading high quality products group, and acclaimed new music orchestra American Composers Orchestra (ACO) are pleased to announce that Milica Paranosic has been selected to receive the fourth ACO / LVMH-sponsored artistic commission. ACO’s Orchestra Underground will perform the world premiere of the work featuring electronics, projections and orchestra at Carnegie Hall’s Zankel Hall. Born in Belgrade, Paranosic lives in New York City. As a composer/sound designer/conceptual and multimedia artist/educator and producer, she has provoked audiences from opera-goers to soccer fans. Classically trained, Paranosic prefers calling herself “classically challenged” as her influences are just as much the ones from the street and pop culture as the ones from her formal education. Paranosic writes music, concepts, sounds, computer patches, theatrical scripts, short stories, and uses human voice, found objects, technological tools and musical instruments as her music carriers, giving them equal “rights.” Paranosic first came to the attention of ACO through its annual new music readings, a nationwide professional development program providing career-building experience and exposure to aspiring orchestral composers. LVMH Moët Hennessy Louis Vuitton is represented in Wines and Spirits by a portfolio of brands that includes Moët & Chandon, Dom Pérignon, Veuve Clicquot Ponsardin, Krug, Ruinart, Mercier, Château d’Yquem, Hennessy, Glenmorangie, Ardbeg, Vodka Belvedere, 10 Cane, Chandon, Cloudy Bay, Terrazas de los Andes, Cheval des Andes, Green Point, Cape Mentelle, Newton, Wen Jun. Its Fashion and Leather Goods division includes Louis Vuitton, the world's leading luxury brand, as well as Céline, Loewe, Kenzo, Givenchy, Thomas Pink, Fendi, Emilio Pucci, Donna Karan, Marc Jacobs and Berluti. LVMH is present in the Perfumes and Cosmetics sector with Parfums Christian Dior, Guerlain, Parfums Givenchy, Parfums Kenzo, Perfumes Loewe as well as other promising cosmetic companies (BeneFit Cosmetics, Make Up For Ever, Acqua di Parma and Fresh). LVMH is also active in selective retailing as well as in other activities through DFS, Sephora, Le Bon Marché, Samaritaine and Royal Van Lent. LVMH's Watches and Jewelry division comprises Bulgari, TAG Heuer, Chaumet, Dior Watches, Zenith, Fred, Hublot and De Beers Jewellery, a joint venture created with the world’s leading diamond group. Now entering its 36th year, American Composers Orchestra is the only orchestra in the world dedicated to the creation, performance, preservation, and promulgation of music by American composers. ACO makes the creation of opportunities for American composers its central purpose. It serves as an incubator of ideas and talent; as a catalyst for growth among orchestras; and as an advocate for American composers and their music. ACO has performed music by more than 750 American composers, including 250 world premieres and commissioned works. Through its concerts at Carnegie Hall and other venues, recordings, broadcasts, educational programs, New Music Readings and commissions, ACO identifies today’s brightest emerging composers, champions established composers and increases awareness of the variety of American orchestral music. Among the honors ACO has received are awards from the American Academy of Arts and Letters and BMI recognizing the orchestra’s outstanding contribution to American music. ASCAP has awarded its annual prize for adventurous programming to ACO 34 times, singling it out as “the orchestra that has done the most for new American music in the United States.” ACO received the inaugural MetLife Award for Excellence in Community Engagement, and a proclamation from the New York City Council. ACO recordings are available on ARGO, CRI, ECM, Point, Phoenix USA, MusicMasters, Nonesuch, Tzadik, and New World Records, and live concert recordings are available at iTunes, Amazon.com and InstantEncore.com. The DC premiere of Claude Debussy’s Martyrdom of St. Sebastian will be presented by the National Philharmonic, conducted by National Philharmonic Chorale Artistic Director Stan Engebretson, on Saturday, May 19 at 8 p.m. at the Music Center at Strathmore. The concert will conclude the May National Philharmonic and Strathmore celebration of the music of Claude Debussy, marking the 150th anniversary of the birth of one of the most important French composers. The concert will feature the National Philharmonic’s nearly 200 voice all-volunteer Chorale, as well as soloists Audrey Luna (soprano); Rosa Lamoreaux (soprano); Linda Maguire (mezzo-soprano); and narrator Eliot Pfanstiehl, founder and CEO of Strathmore. The martyr St. Sebastian's life, death, and miracles have inspired painters and sculptors throughout history and in 1911, it captured the imagination of Debussy in the form of a text by Gabriele d’Annunzio. The work they created together retells the soldier-saint’s story as a medieval mystery play in five tableaux or movements - The Court of Lilies, The Magic Chamber, The Council of False Gods, The Wounded Laurel and Paradise. Reviewers have praised the sheer beauty of the music, with its evocation of ecstasy and mysticism. Describing his intentions with this piece, Debussy wrote, “. . . when in the last act, the Saint mounts to paradise, I think I set down what I felt at the thought of soaring to the heavens!” Audiences agreed. The piece debuted in Paris in 1912 to great critical acclaim and packed houses – one audience member, Arturo Toscanini, made immediate arrangements to take it to La Scala for its Italian premiere, where it also triumphed. Soprano Audrey Luna, whom Opera News says “has power and a blazing coloratura facility that most lyric sopranos can only dream of,” is fast emerging as one of the country’s brightest young artists. Ms. Luna’s 2012-13 season includes her return to the Metropolitan Opera as Ariel in The Tempest by Thomas Adès, Madame Mao in Nixon in China with Lyric Opera of Kansas City, Ariel in The Tempest with Orchestra Dell’Accademia Nazionale di Santa Cecilia, soloist in George Crumb’s Star Child with American Symphony Orchestra at Carnegie Hall, and Zerbinetta in Ariadne auf Naxos with Fort Worth Opera. In summer 2012, she joins L’Opéra Festival de Québec to sing Ariel in The Tempest. Ms. Luna is the 2009 winner of the Loren L. Zachary Vocal Competition and received the top prize awarded in the 2009 Renata Tebaldi International Voice Competition. She has also been awarded first place in the Terzo Concorso Lirico Internazionale “Alfredo Giacomotti,” the Caruso International Voice Competition and Eleanor Lieber Awards, and has garnered prizes from the George London Foundation, the José Iturbi International Voice Competition, Elardo International Opera Competition, the Liederkranz Foundation, the Licia Albanese – Puccini Foundation, and the Metropolitan Opera National Council Auditions. Soprano Rosa Lamoreaux, acclaimed for her "scrupulous musicianship ... gorgeous sound and stylistic acuity" (The Washington Post), is engaged in an international career of broad scope, including solo recitals, chamber music, opera, and orchestral performances at major concert venues: Carnegie Hall, Royal Albert Hall, the Kennedy Center, the Dorothy Chandler Pavilion, Strathmore Hall and the Washington National Cathedral, among others. Her concert tours abroad have included performances in Italy, Germany, the United Kingdom, Brazil, Peru and Japan. Ms. Lamoreaux is Artistic Director of the National Gallery of Art Vocal Ensemble. Her art museum performance venues also include the Louvre, the Metropolitan Museum of Art, the Cloisters and the Phillips Collection. She has recently received her seventh Washington Area Music Association WAMMIE award as Best Classical Vocalist. Mezzo-soprano Linda Maguire is an internationally renowned vocal artist with an extensive resume in concert, recital and opera, as well as live broadcasts and recordings. She has sung regularly with many of the major orchestras of North America, including Calgary, Dallas and Vancouver. 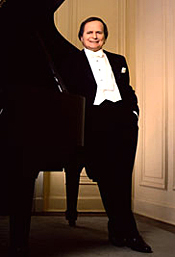 Appearances abroad include Les Musiciens du Louvre, I Virtuosi di Praja, and Les Violons du Roi. 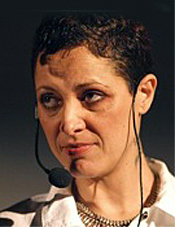 Ms. Maguire attended the Oberlin Conservatory of Music in Ohio before launching her twenty-three year international career as a vocal artist. During this time, she has sung more than thirty "zwischen" (essentially soprano) leading roles in the opera houses of Glyndebourne, Montreal, Dallas and Toronto, among others. Ms. Maguire has sung with City Choir of Washington, in performances of Durufle’s Requiem and Mozart’s Requiem. She also appeared as guest soloist with the U.S. Army Chorus and select members of US Army Band “Pershing’s Own” in a concert featuring music by Schubert and Gershwin. Philharmonia Baroque Orchestra’s 2011-12 season officially ended on April 22, but the music goes on through the summer as Philharmonia Baroque performs on the opening nights of both the 2012 Berkeley Festival & Exhibition and Napa Valley’s Festival del Sole. The 2012 Berkeley Festival & Exhibition opens June 3 with Philharmonia Baroque Orchestra Music Director Nicholas McGegan at the fortepiano in recital with soprano Dominique Labelle, violinist Elizabeth Blumenstock, and cellist Phoebe Carrai, for a concert of “Beethoven Songs & Haydn Trios.” The concert features songs, trios, and solo piano works by Beethoven, Haydn, Mozart, Kotzwara, Monsigny, Boieldieu, and Pleyel. Since its inauguration in 1990, the biennial Festival has been recognized worldwide as one of the premier events of its kind, bringing together early music performers, scholars, instrument makers, publishers, and enthusiasts for a week of concerts, lectures, conferences, and master classes on and around the University of California, Berkeley campus. On Friday, July 13, Nicholas McGegan and the Philharmonia Baroque Orchestra open the seventh season of Napa Valley’s Festival del Sole in a concert featuring soprano Susan Graham at the majestic Castello di Amorosa, a medieval-style Tuscan castle. The program for this concert features several Handel arias; concertos by Vivaldi, Corelli and Durante; and Handel’s beloved Water Music Suite No. 3. The luxurious evening begins with a wine reception atop the castle tower, overlooking breathtaking vineyard views. Guests will then enter the Castello’s beautiful and acoustically-inspired central courtyard for a concert and following the concert, Gala VIPs enter Castello’s Grand Barrel Room, where Festival Founding Benefactors Tatiana and Gerret Copeland will host a lavish dinner complemented by fine wines from Castello di Amorosa and Bouchaine Vineyards. For more information, visit www.philharmonia.org or call (415) 252-1288. You may also visit the Web sites of the 2012 Berkeley Festival & Exhibition at http://bfx.berkeley.edu/ or Festival del Sole at http://festivaldelsole.org/. The ten winners and the Grand Prize Winner of the inaugural PARMA Student Composer Competition have been announced on the PARMA Recordings Web site, www.parmarecordings.com. Congratulations to Grand Prize Winner QUINN DIZON of the University of Louisville, whose piece Awakening for piano quartet will be recorded, produced, released, and promoted by PARMA Recordings and distributed through Naxos on a compilation album on one of our labels. Mr. Dizon and the other nine finalists will have their works published in the 2012 PARMA Anthology of Music: Student Edition, which will be provided to educators and performers free of charge. Visit www.parmarecordings.com/studentanthology to view the full list of winners. 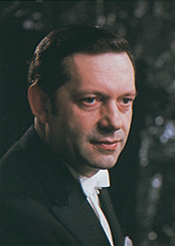 John Page studied at King's College London, University College Dublin, Trinity College Dublin, and Harvard University and began his career with the National Symphony Orchestra of Ireland in 2000. In Ireland, his 2002 performances of Viktor Ullmann's The Emperor of Atlantis with Opera Theatre Company garnered the prestigious Irish Times Opera of the Year award and he was subsequently invited to give a Lyric FM broadcast concert with the NSOI. Throughout the next decade, Page worked with the NEC Symphony, Boston Ballet, the Irish Film Orchestra, the Boston Philharmonic Orchestra, the Modern Band, Mimesis Ensemble, the BBC Ulster Orchestra, and many others with roles ranging from Conductor to Music Director. Richard Brooks is a native of upstate New York and holds a B.S. degree in Music Education from the Crane School of Music, Potsdam College, an M.A. in Composition from Binghamton University, and a Ph. D. in Composition from New York University. From 1975 to 2004 he was on the music faculty of Nassau Community College where he was Professor and, for 22 years, Department Chair. 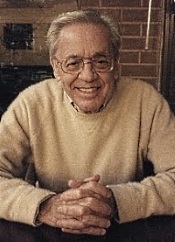 In addition to his services in education, he has composed nearly ninety works for various media and ensembles. Timothy A. Davis is a Massachusett native who brings a variety of administrative, corporate, and new music experience to his role as CEO of the Boston New Music Initiative. Recognizing the need for a strong network across musical disciplines, Tim's motivation in founding BNMI reflects his long-standing commitment to furthering the careers of composers and musicians. 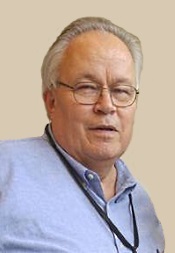 He has served as a judge for composition competitions with the National Federation of Music Clubs and on judging panels for BNMI's Calls for Scores. As an educator, Tim provides private composition instruction, and he worked as an instructor of theory and aural skills at the University of Iowa, where he earned Pi Kappa Lambda honors in graduating with a doctorate in composition in 2009. He also holds degrees from Boston College and the University of Massachusetts. Chris Brubaker is the founder and Manager of ThatNewMusicLibrary.com and ThatNewMusicWebsite.com. 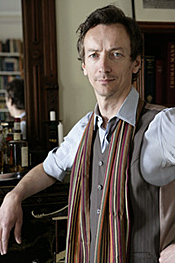 In 2011, PARMA acquired ThatNewMusic, and Chris continues to work as one of PARMA's Musical Advisors. Chris was instrumental in the development and release of the 2011 Anthology Of Contemporary Concert Music, a collection of modern works distributed on ThatNewMusicWebsite, and serves as editor for this Student Edition. PARMA Recordings LLC is the parent organization of the Navona, Big Round, Ravello, and Capstone label imprints. The company's work spans classical, jazz, rock, blues, family, and film, and includes programs and divisions for custom audio, licensing, publishing and more. PARMA's labels feature work by artists such as Grammy-winner Richard Stoltzman, Pulitzer Prize winner Lewis Spratlan, renowned percussionist Steve Gadd, Pixar/Randy Newman orchestrator Jonathan Sacks, New York Philharmonic concertmaster Glenn Dicterow, and The Who's Pete Townshend, among others. PARMA emphasizes new and engaging sounds, innovative presentation, and an interactive experience from all of our physical and digital products. PARMA has pioneered the use of Enhanced Content in our releases to bundle and incorporate digital study scores, recording session photos and videos, composer interviews, applications for mobile devices, and other contextual information to facilitate a greater understanding of new music. When: Friday, May 25, 7:30 p.m.
Kai Talim, an alumnus of the Music Institute of Chicago’s Academy for gifted pre-college musicians, hosts the second annual “Walk with Children” benefit concert featuring other Academy alumni, current students, and friends. The program includes works by Handel, Schubert, Prokofiev, Ravel, Villa-Lobos, Smetana, Piazzolla and more. Says Talim, “On March 11, 2011, Japan was devastated by a magnitude 9.0 earthquake, tsunami and subsequent nuclear disaster. The damage was tremendous; every aspect of the lives of the Japanese has been significantly altered. One of the most striking videos of the disaster was of a girl standing amongst piles of debris, crying out for her mother. As a Japanese-American son of two supportive and loving parents, the stories of the children of Japan have had a tremendous impact on me. My family is everything to me, and I cannot imagine what children who lose their parents go through. I decided I wanted to help these children by raising funds for an organization called ASHINAGA, a group dedicated to improving the lives of Japanese orphans. We cannot provide them with their lost parents. But we can give them the feeling and knowledge that a group of people cares for them. Roy Goodman, Vasteras Sinfonietta. dB Productions dBCD148. 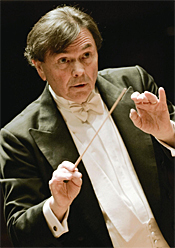 English conductor, singer, and violinist Roy Goodman has been a professional musician for over five decades, leading any number of well-known ensembles like the Brandenburg Consort, the Parlay of Instruments, the Hanover Band, the English Chamber Orchestra, and the European Union Baroque Orchestra. During this time, he’s made over 120 recordings and premiered over 40 contemporary works. 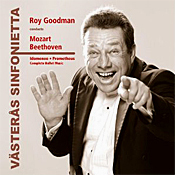 But on the cover of the present album, Roy Goodman Conducts Mozart and Beethoven, he strikes a goofy pose worthy of Latin bandleader Xavier Cugat. Paint a little mustache on him and pretend he’s doing rumbas. Happily, there is nothing goofy about his performances of ballet tunes from Mozart’s Idomeneo and Beethoven’s Creatures of Prometheus. The program begins with the little four-movement ballet sequence that closes Mozart’s Italian-language opera Idomeneo, which he premiered in 1781. Goodman produces a lively and buoyant opening Chaconne, followed by a lovely, flowing Larghetto. The conductor ensures that the transitions are seamless, so everything is of a piece. The next two segments Goodman takes at exhilarating speeds, though never hurried, offering up a conclusion both exciting and celebratory. Beethoven’s dance music for The Creatures of Prometheus is much more extensive than that for the Mozart work, of course, Beethoven’s eighteen movements comprising a full ballet, starting with the familiar Overture. Again, Goodman gets the show started in invigorating fashion. Most of Mozart’s music here is pretty lightweight, to be sure, and without the actual dances as visual markers it’s not easy to follow the story. Fortunately, in Goodman’s hands you don’t need a story (and, yes, if you do need a narrative to follow, you can always read along from Goodman’s booklet notes). Goodman keeps the proceedings moving along at a healthy clip, maintaining the drama and the fantasy of the music neatly tied together. It’s all quite delightful, really. Goodman does suggest in his notes that the music of Creatures may have marked a turning point in Beethoven’s output from the Classical period to Romanticism. And maybe that’s why Goodman presents it in so fluid, imaginative, and nonrestrictive a manner. As a final observation, if you recognize the theme in the last movement, it’s because the composer would use it in the finale of his Third Symphony a couple of years later. If you’re going to borrow, borrow from the best. The engineers at dB Productions recorded the music on May 6-11, 2011, in the Vasteras Konserthus, Vasteras, Sweden. It sounds vibrant, with excellent midrange clarity and transient response. The Vasteras Sinfonietta is a chamber orchestra of just over thirty players, so the recording captures a fine intimacy. Although the sound is a tad thin in the bass and maybe a little forward at times in the lower strings, it is no cause for alarm because there is also a touch of hall resonance as compensation. The engineers miked the affair at a moderate distance, producing a slightly constricted stage width but rather good depth. With dynamics that are not particularly extraordinary but more than adequate, the result provides an enjoyably realistic listening experience, with a sense of you-are-there presence. The eighth-movement Allegro of The Creatures of Prometheus is especially useful in showing off the recording’s depth and transparency. And why the goofy cover picture? Who knows. Maybe Goodman was up to being a little silly, or maybe he just wanted to get our attention. He did--with his exemplary performances. Also, Serenade melancolique; Bruch: Scottish Fantasy. Arthur Grumiaux, violin; Jan Krenz and Heinz Wallberg, New Philharmonia Orchestra. PentaTone Classics SACD 5186-117. I have always thought of Arthur Grumiaux as a rather sedate violinist, a refined and cultured gentleman seldom given to flights of fancy or overt showmanship. Thusly does his 1975 recording of the Tchaikovsky Violin Concerto strike me, a classic example of allowing the music to speak for itself. For comparisons, I had on hand two other skilled exponents of the bow whom I highly admire, Perlman and Heifetz, both of whom are more outwardly showy and energetic in the work. Well, there’s no denying that Tchaikovsky requires both technical virtuosity and a strong degree of passion, and I don’t mean to imply that Grumiaux hasn’t qualifications in either department. There is emotion in every note he plays. It’s just that his appears to be a more effortless passion than the others display. Perhaps the man expressed his relaxed and sensitive approach to music making even better in the disc’s companion piece, the Bruch Scottish Fantasy, where Grumiaux allows the often-lyrical and rhapsodic folk tunes literally to soar. It is delightful. The sound, which Philips recorded originally in four channels but made heretofore available only in two-channel stereo, is, like the performances, easygoing, warm, and slightly soft in its two-channel presentation, even in its SACD layer played back through a Sony SACD player. I found this especially apparent in the comparisons I made, the Perlman on a Chesky gold remastering, the Heifetz on one of JVC’s XRCDs. Both Perlman and Heifetz sounded noticeably more focused and precise, with better orchestral depth. I’m not suggesting, however, that there is anything wrong with the PentaTone sound, and, indeed, many listeners may prefer it to the more analytical presentation on the Chesky and JVC discs. A final concern: Why buy PentaTone? They make hybrid SACDs containing a multichannel layer (from 3 to 5.1 channels) and a regular two-channel layer. They produce some recently recorded work and some older, quadraphonic pieces. And, as I say, they are capable of holding up to 5.1 channels. But since Philips recorded the Tchaikovsky and Bruch in four channels, not five-point-one, the record company chose to keep it that way rather than try to synthesize a center channel and/or create a separate bass. I’d say if you have the capability of playing things back in the Super Audio CD format, PentaTone offers that distinct advantage. Another plus is that PentaTone probably mastered even the regular stereo layer to disc as well as it could be. I found the sound reasonably quiet, and, slightly soft or not, still quite natural and pleasant. Then there’s a final reason for considering this particular PentaTone release: As far as I can tell, no one but PentaTone is still making the performances available new (although one can certainly find used Philips copies available). In any case, it’s a disc worth looking into. 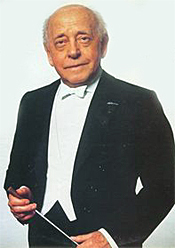 Eugene Ormandy, Philadelphia Orchestra. HDTT HDCD251. Anyway, this album of Famous Marches from Ormandy and the Philadelphia Orchestra tends to put the lie to his being straightlaced; in these marches we see a meticulous conductor who presented the music almost exactly as we always imagined it. This was no letter-perfect Toscanini or wild-eyed Stokowski; this was a man who tried to put as little of himself into the music as possible, letting it speak for itself. Which is to say, these marches are not the most creative, distinctive, or scintillating around, but they are probably pretty close to being everything most listeners would hope they’d be. 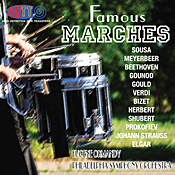 Each of the thirteen selections on the disc is a genuine “famous” march. You name the march, it’s probably here, starting with Sousa’s “Star and Stripes Forever,” which you might have expected to close the show, but it makes a nice curtain raiser. Ormandy gives it an appropriate flourish. Among my own favorites on the program are Gounod’s “Funeral March of the Marionette” (think Alfred Hitchcock Presents); Verdi’s “Grand March” from Aida; Bizet’s “March of the Toreadors” from Carmen; Schubert’s regal “Marche Militaire”; and Elgar’s first and best march, “Pomp and Circumstance No. 1,” known to high-school graduates the world over. Musically, Ormandy takes the “March of the Marionette” at a slow and stately pace. Gould’s “American Salute” exhibits a great thrust and vigor. The Aida march shows much splendor, even if Ormandy doesn’t seem particularly imaginative about it. Bizet’s “Toreadors” enter with a speedy rush as though already chasing bulls around the ring; while it’s probably a tad too fast for my taste, there’s no doubt it generates quite a lot of excitement. Victor Herbert’s “March of the Toys” has a genuinely magical appeal to it. In Prokofiev’s satiric march from “The Love for Three Oranges,” Ormandy provides a wonderfully faux-noble pomposity. Johann Strauss Sr.’s “Radetzky March” displays an impressive strut. And, finally, for sheer pomp and circumstance, you can’t beat Edward Elgar’s “Pomp and Circumstance March No. 1,” in which Ormandy goes all out to impart as much grand enthusiasm as possible; he may not capture all the drama of the music as well as Sir Adrian Boult or Sir John Barbirolli did, but it’s close. In terms of the remastered sound, it comes to us from HDTT, High Definition Tape Transfers, the company that uses high-quality open-reel tapes in the public domain as its source material. I found the sonics, recorded by Columbia to a 4-track tape between 1959 and 1963, excellent, as I have found everything from HDTT. However, it was only after listening to the entire disc that I began thinking I’d heard it all before. I had. I checked out my own collection afterwards and found myself amazed to find I already had it in my collection! Well, close: What I had was a two-disc set of the same marches and more from Ormandy and the Philadelphia Orchestra remastered by Japanese CBS/Sony in 1983, a set I’d bought some thirty years ago and hadn’t had the chance to listen to more than once or twice since. So not only did I have my notes on the sound of the HDTT disc, I had another, different remastering of the same material from Japan (presumably taken from the master tapes) for a side-by-side comparison. I’m happy to report that the HDTT sound was just as good as or better than the Japanese remaster. The HDTT sound, which Columbia recorded in the Academy of Music, Philadelphia, at various times, is at times massive and warmly reverberant and at other times close and slightly dry. In any case, it’s always big, big, big, as it should be in these marches, with a modest-to-strong dynamic impact and a superwide frequency range. Highs are quite prominent, maybe a little forward at times; midrange transparency is more than adequate; transients sound quick and lively; stage depth is realistic; highs are gleaming; and bass is evident when needed (that big bass drum is a band staple, no?). And compared to the Japanese import? The HDTT disc sounded a touch more open and airy and perhaps just a hair brighter, with a touch of pre-echo between tracks. The CBS/Sony discs sounded maybe a shade warmer and smoother. It was so close, though, that one could argue a case for either side. However, the point seems moot because the Japanese discs appear to be out of print and unavailable even in Japan, just as the domestic Sony product has disappeared from the catalogue. No matter; the HDTT disc holds its own quite nicely. As always, the folks at HDTT make their music available in a variety of formats for a variety of pocketbooks, from Redbook CD’s, 24/96 DVD’s, and HQCD’s to 24/96 and 24/192 (on select titles) Flac downloads for playback on high-end computer audio systems. For details, visit http://www.highdeftapetransfers.com/storefront.php. Also, Lux Aeterna; Mosaics. Gerard Schwarz, Seattle Symphony. Naxos 8.559701. If you’ve seen Ridley Scott’s 1979 sci-fi/horror movie Alien, you’ve heard a part of Howard Hanson’s Second Symphony, or if you have any Mercury LP’s or CD’s, you might have heard Hanson conducting any number of recordings he made in the Fifties and Sixties. Hanson (1896-1981) was a Pulitzer Prize-winning American composer, conductor, teacher, and musicologist who gave the world quite few good musical compositions as well as an equal number of good audiophile recordings. 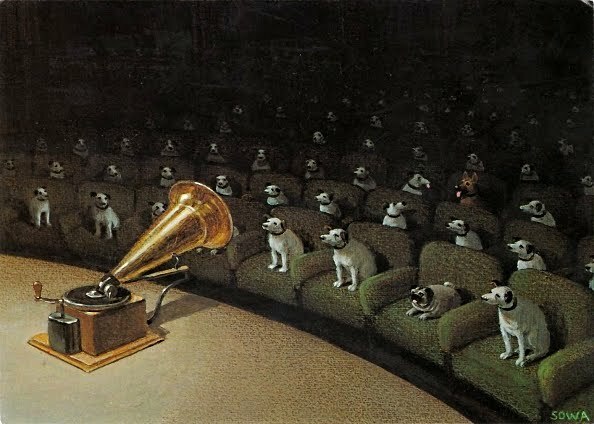 On the present disc, we hear his Symphony No. 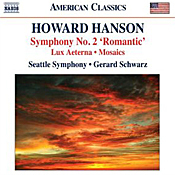 2 “Romantic” and several shorter works, Lux Aeterna and Mosaics, all recorded by Maestro Gerard Schwarz and his Seattle Symphony in 1988, 1992, and 1994 for the Delos label and re-released by Naxos in 2011. Schwarz’s disc makes an excellent alternative to Hanson’s own recording of the Second Symphony for Mercury. Hanson wrote the Symphony No. 2 in D-flat major, Opus 30, in 1930, with the subtitle “Romantic.” The subtitle is entirely appropriate as the work sounds much like a continuation of late nineteenth-century Romanticism, with shades of his Romantic contemporaries Rachmaninov and Sibelius along the way. Hanson was something of an old-fashioned holdover in this regard, saying that his intent was to write music “young in spirit, lyrical and romantic in temperament”; with the Symphony No. 2 he obviously succeeded. Viewed today, it’s probably his most-famous, most-accessible work. It’s no wonder we hear bits and pieces of it throughout popular culture. The introductory segment of this three-movement symphony begins with a grandly melodramatic sweep and then opens up to a beautifully melodic theme we’ll hear in various guises throughout the work. Schwarz takes particular delight in the more poetic aspects of the score, while giving full measure to its rhapsodic qualities. Although Hanson tended to throw quite a lot into the stew, Schwarz holds it all together without its becoming too sentimental. Alien lovers will, well, love it. Hanson once said that he did “not believe that music is primarily a matter of the intellect, but rather a manifestation of the emotions.” The symphony’s Andante con tenerezza (“moderately slow, with tenderness”) reiterates some of the first movement’s thematic content, although in much altered form, with Schwarz taking more of his time with it than the composer did in his own recording. The concluding Allegro con brio (“quick and lively, with vigor and vivacity”) starts with a flourish worthy of Hanson’s teacher Ottorino Respighi and The Pines of Rome before settling into its lush, rhapsodic closing material. Schwarz again emphasizes the recurring theme, this time on a more grandiloquent scale, closing the show in fine fashion. As companion works, Schwarz and company provide two of Hanson’s briefer pieces, first the Lux Aeterna (“Eternal Light”), from 1923. It was a common chant for a Requiem Mass and probably came about as a result of Hanson’s fascination for sixteenth-century Italian composer Giuseppe Palestrina and for Gregorian chant. It’s a rather somber, almost melancholic work, and Schwarz probably does more than anyone to make it seem more important and less pompous than it is. I admit it does exude a strangely calming effect. The second filler, Mosaic (1957), is a later piece from Hanson, a brief set of variations in his usual brooding Nordic style. This is maybe Hanson at his most Sibelian, so take that as you will. Certainly, Schwarz does his best to bring out all the color and emotional intensity in the work. Originally, it was Delos who recorded the sound, all three selections at the Seattle Opera House in 1988 (Symphony), 1992 (Mosaics), and 1994 (Lux Aeterna). The sound is quite expansive, stretching across the speakers and beyond, with a smooth response and a reasonable degree of depth besides. The midrange sounds a trifle thick, not as transparent in the Second as Hanson’s Mercury recording, which remains an audiophile choice, and there is just a hint of edge to the Seattle recording’s lower treble, evident in the strings from time to time. A strong dynamic thrust and a touch of ambient bloom complete a fairly lifelike acoustic picture. The Music Institute of Chicago Chorale, conducted by Daniel Wallenberg, concludes its 25th Anniversary Season with “25 Great Years,” presented by the Music Institute of Chicago Sunday, June 10 at 3 p.m. at Nichols Concert Hall, 1490 Chicago Avenue, Evanston. In addition, the Chorale invites music lovers to join them in song at two Summer Sing-alongs June 27 and July 25 at 7:30 p.m. at the Music Institute’s Evanston East Campus, also 1490 Chicago Avenue. Highlighting audience favorites from the Chorale’s history, the program features madrigals by Monteverdi, Morley, and Gines de Morata; part songs by Haydn, Rossini, Schumann, Lauridsen, and Whitacre; selections from The Liebeslieder Waltzes by Brahms; Verano Porteño by Piazzolla; folk songs from Bulgaria, Canada, South Africa, and England; and show tunes by Ellington and Loesser. Special guests at the concert are the Kotlyar-Shifrin Piano Duo—Irina Kotlyar and Gregory Shifrin. The duo has won several international competitions and has performed with orchestras around the world, including in Israel, Europe, and the U.S. The Chorale welcomes those who love choral singing to join them at two Summer Sing-alongs. 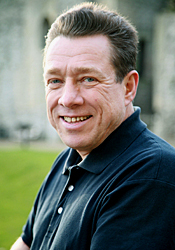 On Wednesday, June 27, the group will sing Mozart’s Regina Coeli and Haydn's Lord Nelson Mass, conducted by Frank Winkler. On Wednesday, July 25, the sing-along participants will perform Mozart’s Requiem, conducted by Daniel Wallenberg. Each sing-along has an optional free rehearsal the day before—June 26 and July 24, respectively—at 7:30 p.m. at the Music Institute’s Evanston East Campus, 1490 Chicago Avenue, Room 9. The Music Institute of Chicago Chorale is a community chorus that provides an opportunity for adult singers with prior experience to study and perform the best in sacred and secular choral music. Now celebrating its 25th anniversary, the Chorale has one continuing goal: to perform the finest sacred and secular choral music with the highest of standards in a community setting. Under the leadership of Conductor Daniel Wallenberg, the Chorale has developed a wide range of repertoire, including motets, madrigals, part-songs, folk songs, and larger choral-orchestral works by Bach, Beethoven, Haydn, Mozart, Durufle, and many others. Throughout the years, the Chorale has collaborated with local choirs and symphony orchestras and has produced two fully costumed Elizabethan madrigal dinners. In addition, the Chorale has collaborated several times with the Music Institute’s voice faculty for concerts of opera and Broadway music. Chorale conductor Daniel Wallenberg is also on the staff of the Chicago Children’s Choir, working with the In-School Chorus and After-School Programs for the Rogers Park and Humboldt Park Neighborhood Choirs, as well as its world-renowned Concert Choir with whom he toured Ukraine and the United States. He is the director of the junior and adult choirs at the Jewish Reconstructionist Congregation and the founder and artistic director of “Zemer Am,” the Chicago Jewish Choral Festival. A native of Bogota, Colombia, Wallenberg founded several adult and children’s choirs while living in Israel. The Music Institute of Chicago believes that music has the power to sustain and nourish the human spirit; therefore, our mission is to provide the foundation for lifelong engagement with music. As one of the three largest and most respected community music schools in the nation, the Music Institute offers musical excellence built on the strength of its distinguished faculty, commitment to quality, and breadth of programs and services. Founded in 1931 and one of the oldest community music schools in Illinois, the Music Institute is a member of the National Guild of Community Schools of the Arts and accredited by the National Association of Schools of Music. Each year, the Music Institute’s world-class music teachers and arts therapists provide the highest quality arts education, reaching more than 10,000 students of all ability levels, from birth to 102 years of age, at campuses in Evanston, Highland Park, Lake Forest, Lincolnshire, Winnetka, and Downers Grove and through its longstanding partnership with the Chicago Public Schools. The Music Institute also offers lessons and programs at the Steinway of Chicago store in Northbrook and early childhood and community engagement programs throughout the Chicago area and the North Shore. 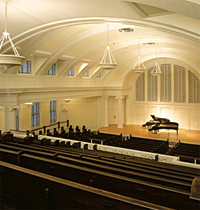 The Music Institute offers lessons, classes, and programs through four distinct areas: Community School, The Academy, Creative Arts Therapy (Institute for Therapy through the Arts), and Nichols Concert Hall. “25 Great Years,” celebrating the 25th anniversary of the Music Institute of Chicago Chorale, takes place Sunday, June 10 at 3 p.m. at the Music Institute of Chicago’s Nichols Concert Hall, 1490 Chicago Avenue, Evanston. Tickets are $15 for adults, $10 for seniors, and $7 for students and are available at 847.905.1500 ext. 108 or at musicinst.org. The Chorale’s Summer Sing-alongs take place Wednesday, June 27 and Wednesday, July 25, both at 7:30 p.m. at the Music Institute’s Evanston East Campus, 1490 Chicago Avenue, Room 9. The cost to participate is $10 per person; call 847.905.1500 ext. 127. Optional free rehearsals take place June 26 and July 24 at the same location. This spring, Orpheus is thrilled to embark on their 12th tour of Japan. Since their first trip to the country 24 years ago, Orpheus has enjoyed a fruitful and invigorating relationship with Japan's passionate music lovers. As artistic director Ronnie Bauch notes, "Since 1988, Orpheus has presented more performances in Japan than in any country outside the United States. Our Japanese audiences and supporters have played a major role in almost every facet of the Orpheus career and legacy. It's fitting that we celebrate the beginning of our 40th Anniversary with this important tour and we look forward to renewing and deepening friendships." "MetLife Foundation recognizes Orpheus' achievements over the years and its commitment to serving diverse audiences," said Dennis White, president and CEO, MetLife Foundation. "During this 40th anniversary season, we are proud to support the Orchestra's Japan Tour, along with extensive touring throughout the United States." While on tour, Orpheus will perform programs of Rossini, Beethoven, and Mendelssohn in six venues in a week and will be joined by frequent collaborator Ryu Goto. In addition, Orpheus will participate in the ongoing revitalization efforts of communities in the Tohoku region. Through multiple community programs built into this tour, Orpheus will seek to engage Japanese audiences in an intimate dialogue with musicians about the unique Orpheus Process (TM) of music-making and to continue ongoing cultural exchange efforts. During their stay in Japan, the musicians will meet with students at the Shukoh Middle School (Tagajo campus) and engage in some music-making activities with them before visiting the areas near Sendai that were affected by the devastating earthquakes and tsunami. Orpheus members will also interact with children being assisted by The Recovery Assistance Center of Miyagi prior to their attending the performance at Centennial Hall in Tohoku University. There are also plans being finalized for members of Orpheus to take part in a community forum with Japanese composers in Tokyo. Orpheus' 2012 tour to Japan is made possible by Official Tour Sponsor MetLife Foundation, Gold Level Sponsor KPMG AZSA & Co., and Tour Supporters the Bank of Tokyo-Misubishi UFJ, and Asian Cultural Council. 23-year-old Ryu Goto made his debut at Sapporo, Japan's Pacific Music Festival, where he played Paganini's Violin Concerto No.1 in 1995. Today, he is an internationally renowned performer having been featured with the National Symphony Orchestra, the London Philharmonic, Symphonica Toscanini, and Wiener Symphoniker. His self-titled debut CD, released in 2005, quickly became the best-selling classical album in Japan that year. In addition, Goto was featured in his own Fuji TV Show Ryu Goto's Odyssey, a chronicle of his career and personal life from 1996 to 2006. Orpheus began its relationship with Ryu Goto in 2008 with a sold-out tour of Japan that concluded with a dazzling concert in Tokyo’s Suntory Hall. The concert was such a success that Orpheus invited him to make his Carnegie Hall debut with them in 2010. After the performance the New York Times said of Goto's rendition of Bruch's Violin Concerto in G minor: "The ensemble’s full-blooded and unsentimental approach complemented Mr. Goto’s expressive playing, with his sweet tone particularly lovely in the Adagio. Mr. Goto further demonstrated his impressive technique and musicality in the encore, a fiery rendition of Nathan Milstein's 'Paganiniana.' He blazed through the innumerable hurdles with finesse." Goto would later play at Orpheus' 2011 gala at Jazz at Lincoln Center. Ryu's youthful energy is a perfect match for Orpheus' unorthodox approach, and Orpheus is proud to continue their fruitful collaboration. A self-governing organization, Orpheus Chamber Orchestra was founded in 1972 by a group of fellow musicians who aspired to perform diverse orchestral repertoire using chamber music ensemble techniques. Today, Orpheus continues to uphold this philosophy, performing without a conductor and rotating musical leadership roles for each work. Striving to empower its musicians by integrating them into virtually every facet of the organization, Orpheus is changing the way the world thinks about musicians, conductors, and orchestras. The organization WorldBlu has named them one of the most democratic workplaces in America for five straight years. The musical results of this method are extraordinary: The Chicago Tribune gushes, "Orpheus Chamber Orchestra shattered the mold, becoming in the process one of the more memorable events in this festival's 13- year history." And the New York Times raves, "Orpheus, whose string players perform with the physical verve of members of a string quartet, produced a convincingly fullblooded sound." The Los Angeles Times agrees: "A virtuosic whole...they’re fast. They’re together. They’re aggressive. They can be electrifying."